Iron Workers Local 48 is located in Oklahoma City. We are a mixed local consisting of structural, rebar and ornamental iron workers. Iron work involves the erection of structural steel which includes hand rail, steel stairs, and various other metals including ornamental metals, such as aluminum, brass and copper. 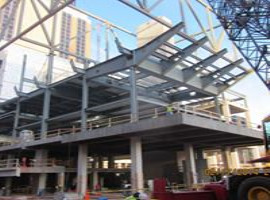 Iron workers erect and place pre-cast, pre-stressed and post-stressed concrete structures. Iron workers also place reinforcing rebar in foundations, bridges and various other poured in place concrete structures. Another aspect of Iron work is the rigging and placing of large machinery and components using precision instruments to place large pieces of machinery and other items to within thousandths of an inch accuracy.